Miss Mani Monster! : Jindie Swatches! I've got a sneak peek at Jindie Nails upcoming collection! Jindie Nails is an online nail polish boutique that sells handmade, gorgeous polishes! As Jen from Jindie so perfectly describes it, it's "nail art in a bottle," completely unique, and one of a kind! All of her polishes are cruelty-free and three-free, and hand-mixed from scratch. You can tell how much love goes into these!! First up is Hex on the Beach from the Summer Chic Collection, white crelly with matte baby pink, peach, red, orange, pastel yellow and bright yellow dots, diamonds & hex glitters. It also has metallic copper & light pink dots & hexes, which complement its peachy shimmer. Pictured below is 3 coats. Up next is That Purple Ish, a periwinkle crelly base with silver shimmer and wine-colored, purple, lilac, lavender, hot pink, navy and magenta dots, squares and hexes. I layered this over Butter London Sprog and only used 2 coats! The next polish is She Blinded Me with Science LE, a light pink crelly with neon, holographic and metallic dots, squares, diamonds, rectangles and hexes, along with various size silver holographic dots, matte black dots, large metallic turquoise dots, lime green large metallic dots, matte pale purple dots, white dots and moons, and matte gray moons. This one will NOT require fishing for glitter if you couldn't tell!! Finally I have Betty's Fetti Milkshake from the Summer Chic Collection. 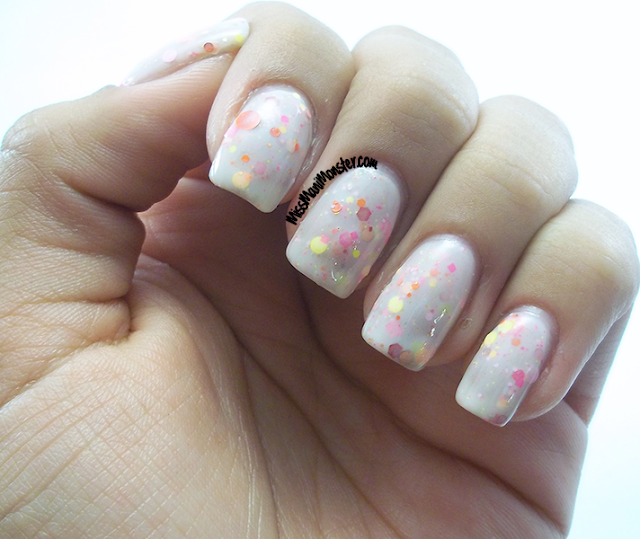 This white crelly is packed with matte neon and pastel microglitters. Named for the treats we all indulge in, it reminds me of funfetti and sprinkles! All of these shades will be available in mid-August, with medium size priced at $5 and full size priced at $10. Please check back at jindienails.com to keep updated on all of Jen's incredible polish creations, and keep up with her on Facebook to stay posted on her restock!